More than 93.4 million personal computers shipped around the globe in the final quarter of 2010, with HP (s hpq) leading the pack of vendors and holding 18.8 percent of the market. Acer, Dell (s dell), Lenovo, and Toshiba rounded out the top five, combining for 58.3 percent of the overall PC market last quarter, according to research firm Gartner (s it). Such sales numbers might be cause for celebration except for one problem: Not one of these companies has a significant presence in the even faster growing smartphone market. Just how big is the market for pocketable computers — a market the computer industry has had a three-decade head start on? I haven’t yet seen fourth quarter smartphone sales estimates, so we can’t make a direct comparison, but Gartner’s third quarter numbers from last year show that 80.5 million smartphones were sold. That’s nearly equal to the 88.3 million computers shipped in the third quarter, just about 10 percent higher than that of smartphones. Another startling datapoint to illustrate the challenge faced by PC makers: The up-and-coming Taiwanese company, HTC, expects to sell 60 million smartphones in 2011, which alone would rival the entire 62.7 million computers Gartner says HP sold in 2010. And of course, one can point to nearly 40 million iPhones sold by Apple in its 2010 fiscal year, or roughly three times the 13.6 million Mac computers sold during by Apple (s aapl) in the same period, showing that Apple has a clearer understanding that the future is mobile. Apple has devoted much effort towards iOS devices and is even bringing iOS concepts to its upcoming desktop upgrade called OS X Lion. These sales trends have been in the works for a few years now, so it’s not surprising that smartphones are about to surpass PC sales, if they actually haven’t already. What is surprising however, is that those top five computer manufacturers aren’t even in the conversation when discussing smartphones. Sure, Dell (s dell) is starting to get in the game with both Android (s goog) smartphones and tablets, but it’s not a top-tier brand in either yet. Toshiba and Acer have been in and out of the smartphone game in the past, both using Microsoft Windows Mobile (s msft) at the time, and that hasn’t worked out either. Acer has since tried to use Android, but its name isn’t on the tip of my tongue when talking about hot phones. That leaves Lenovo and HP, each of which has their own potential plan to remain relevant in a mobile future. Lenovo is leveraging its home base in China, an area ripe for handset growth, even after it sold its smartphone division in 2008 and then paid double to buy it back 18 months later. But the company hasn’t yet pushed its smartphone strategy beyond the borders of China, where it faces competition from a growing number of cheap Android handsets. Meanwhile, HP purchased Palm in April of last year for $1.2 billion to get a foot in the door for smartphones, tablets and other devices running on the Palm webOS platform. No new webOS products have come from the purchase yet, but next month, HP is holding an event where it’s expected to debut updated mobile gadgets. Even so, the webOS platform is still far behind the bigger players, such as Android and iOS, when it comes to available apps. Ultimately, all five of these traditional computer makers are big losers when it comes to the smartphone market right now, although some still have slivers of opportunity available. The longer they cling to lower-margin desktops and laptops, however, the more they risk irrelevancy in the future. And if the comparison in device sales numbers don’t wake them up, maybe innovative accessories that turn smartphones into little laptops, such as the Motorola Atrix 4G dock (s mmi) shown above, will sound the warning bells. Nvidia ARMs Itself: Who Has the Most to Lose? Thanks for this wonderful post Jeff. I truly agree with you when you say “Ultimately, all five of these traditional computer makers are big losers when it comes to the smartphone market right now”. In fact mobile is the best marketing channel available today. To utilize this medium properly and to make the business fraternity know about your company profile, participate in Click Asia Expo 2011 which will be held alongside Click Asia Summit 2011- Asiaâ€™s largest Digital & Mobile Marketing Conference. Wait until the day that the launcher moves from the OS X desktop to the iPad or iPhone. I see the launching of applications from devices onto the big screen as the path towards iDevices moving past mobile. Moto is the only other device maker with seemingly similar thoughts. Good Analysis Kevin. The profit margins in the smart phone markets is going to come down as RIMM, Nokia, Windows and Android based players have recently (in past 6 months or so) introduced smart phones comparable to iPhones. The fact that one can use a docking station with smart phone to get the Laptop experience is going to impact the demand for netbooks and laptops. After all even though many customers can afford multiple gadgets they prefer to integrate everything into a small portable gadget like a smart phone especially if you can get the experience of a laptop when needed using a docking station. Seems to me that the two previous comments both have valid points, both of which came to me upon reading this article as well. ASP’s for computers should be above ASP’s for smart-phones, where there is very significant pricing pressure (even the best phone won’t command significantly above $600 from a cell provider), and the R&D costs could actually be higher on a per unit basis. Margins on phones, especially non-iOS, are going to be dropping fast if they haven’t already. 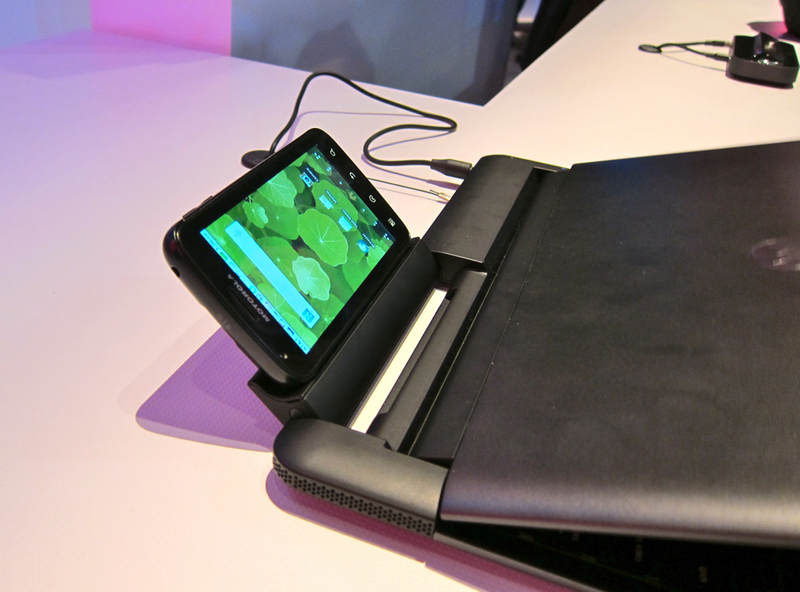 I could actually see HP’s margins on its business line of laptops being markedly higher than an average smart-phone. As far as replacement, I don’t see people replacing laptops with smart-phones, even the Atrix4G. The pricing for the phone and dock will be too close to a laptop price, so people will end up with a laptop and a smart-phone. Plus, businesses and students can’t get away from a more powerful laptop. The possible exception would be an Android phone powering a laptop that runs a thin-client system a la Chrome OS, but this is at best several years away, and probably not practical for people who travel at all (I am thinking use on a plane – not possible with current Chrome OS because you need internet access to log onto the machine). I am certain that my house (currently 2 laptops and 1 smart-phone owned, plus the same provided by jobs) will not ever forgo a PC completely. After all, what if I take the phone with me shopping and my wife wants to use the computer (or vice versa)? I think this is a valid and interesting point and certainly the trend for mobile devices is definitely upward. I do think that the direct comparison of number of units shipped is a misleading one, though. Mobile devices are typically priced lower and viewed as more “disposable” than PCs. The PC (including laptops) market has also stabilized to the point where new models don’t typically provide the drastic upgrades in features and functionality. That means that the replacement rate for mobile devices right now is bound to be much higher than for PCs. I’d be curious to see the difference in revenue for mobile devices versus PCs. While it seems almost certain that Apple is making a lot more money off of mobile devices than they are on Macs, I wonder how that revenue compares to what HP makes on desktop and laptop PCs, which are often priced much higher. I suspect even if you take the high-end server market out of the equation, HP’s revenue from PCs still dwarfs what Apple or any other company is bringing in from mobile devices. Good points, Jeff and I’ll dig up what I can on the revenue side for another post. Bear in mind that the profit margin percentages are generally much higher in the smarpthone market than in the PC market. Apple’s average selling price for an iPhone is actually around $600 when the subsidy is included. Yet the handset costs about $250 or less in parts – granted, there are other costs involved: R&D, production, etc… but PC makers face the same costs. That’s just one example though, so I’ll look to revisit with additional data to see if there are any surprises. Agree. They’re two different markets because – at least in the affluent West – a smartphone is not a replacement for a PC, it’s complimentary. It’s like arguing that it’s bad news for Ford because Yamaha are selling more motorbikes until you realise that the customer has his F-150 for winter and the YZF for when the weather’s nicer. I’m not suggesting that the PC, nor the companies that make them, are going away. I’m simply pointing out that these folks are becoming less relevant to the future. Agree or disagree? At the moment, no, I don’t, at least in terms of replacement. Until people start replacing their desktops and notebooks with smartphones then they’re complimentary markets, not competitive ones. However, I’d argue that they are getting into the smartphone market anyway in a limited way. HP have Palm and all the IP that goes with that brand, Dell and Acer are flirting with Android (you won’t have seen a lot of Acer because their main market is Asia), Toshiba’s main market focus is Japan which leaves Lenovo who just find it too expensive for now. Which is the problem: Cost. They’re going to be going up against Nokia, Samsung and LG who have massive distribution and reach. I’m not sure they’re equipped to do that until costs come down. another point: A PC stays with the user for 3-4 years or longer whereas the smartphone gets replaced much sooner. I don’t have the link, but I have recently read reports from the folks that count ad hits on the web, that in 2011 the number of hits from mobile devices will exceed the number of hits from regular desktop computers for the first time. In other words, that the web will essentially be accessed more frequently and in greater numbers from mobile devices than desktop devices. So there is really a lot of support for the idea that we are seeing a sort of tipping point. That we are moving from the old desktop computer paradigm to the new mobile device paradigm exactly as Kevin argues. Even if the timing is off by a year, it doesn’t really matter. It’s a definite change IMO and it doesn’t seem likely to reverse either.